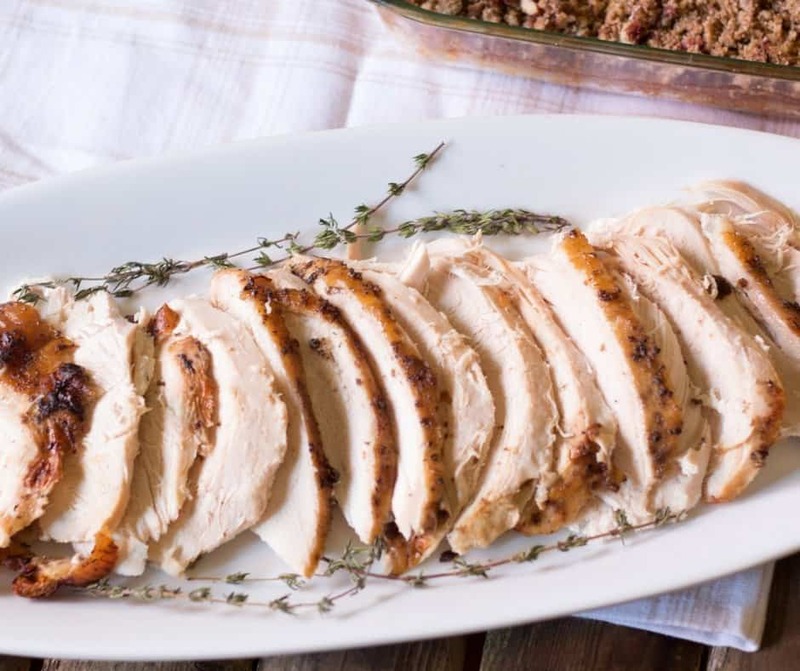 Roasted Turkey Breast with Bourbon Maple Glaze is easy and delicious! The bourbon maple glaze is quick to make and adds an amazing flavor to the turkey breast. 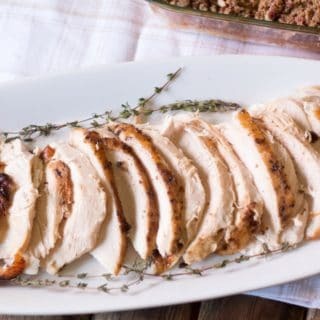 A roasted turkey breast is easy to prepare for Thanksgiving for an additional turkey or for a smaller crowd! 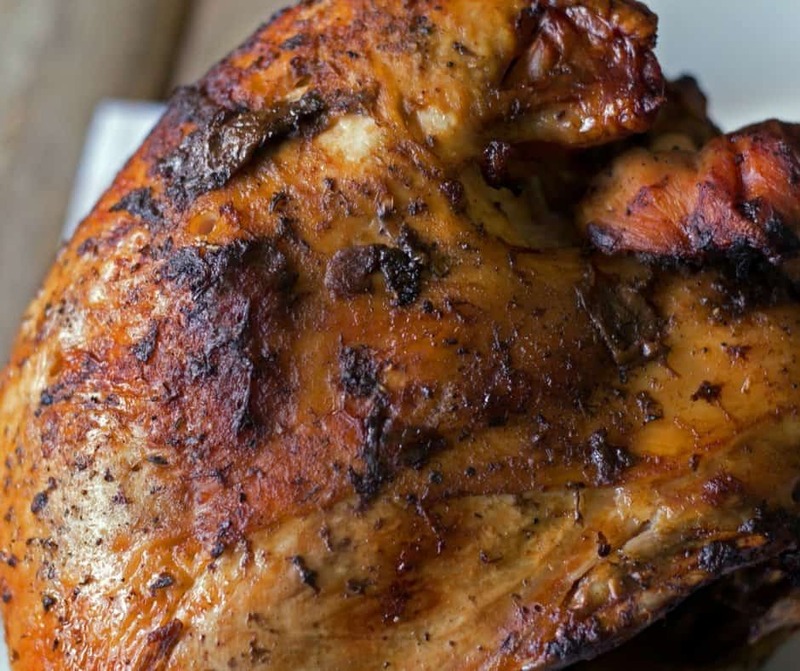 The bourbon maple glaze is awesome on any type of turkey and also perfect on roast chicken! I love Thanksgiving! Celebrating family and friends getting together without any expectations except laughter and great food! How can you go wrong with those expectations! Whether you need a huge turkey, drumsticks only, perhaps even a chicken, who cares as long as your family and friends are having fun! 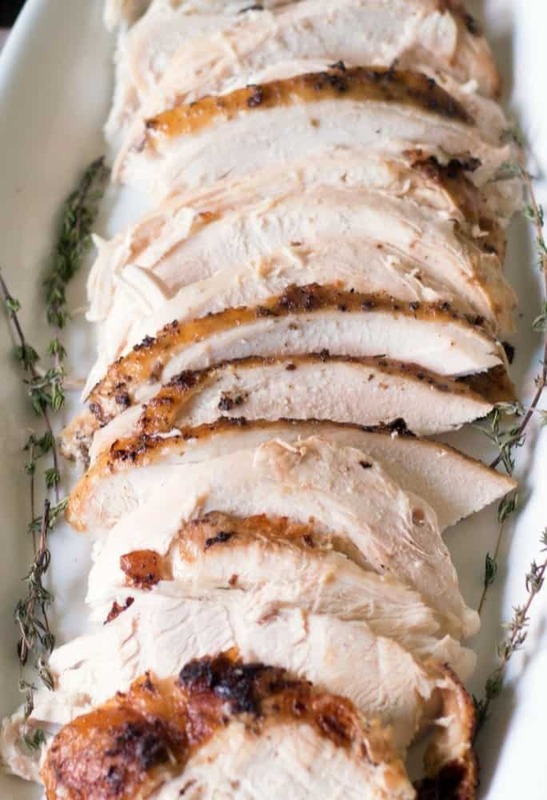 This Roasted Turkey Breast is so easy to prepare. The bourbon maple glaze on the turkey is absolutely delicious and adds amazing flavor to the meat. You can actually use this on any turkey, turkey legs, wings, and of course chicken too! Bourbon Maple Glaze, yup that’s right, it is just yummy! This is an easy glaze to prepare, about 20 minutes, and it makes such a delicious coating for the turkey. The turkey is so juicy and the combo of the bourbon, maple and OJ is outstanding! How long does it take to cook a Roasted Turkey Breast? Estimate cooking times should be about 15-20 minutes per pound. A cooked turkey should have an internal temperature of 165 degrees. What is the timeframe to defrost a Turkey Breast? I go by Butterball, which states its about 1 1/2-2 days to defrost in the fridge! Can a turkey breast defrost on a counter overnight? Absolutely not! Do not defrost turkey or any meat overnight on a countertop. Defrost as noted above in the fridge. Do I need to cover the turkey breast with foil while I am cooking it? If the turkey is browning too quickly, cover the turkey with a foil tent to prevent burning. Why roast turkey, breast side down? Cook a turkey with breast side down to ensure the white meat is not overcooked. White meat can get dried out, the juices run down, keeping the breast meat moist. Can the Bourbon Maple Glaze be used on a whole turkey? You bet! The bourbon maple glaze is delish and can be used on a whole turkey, chicken, pork, and seafood! Okay, anything! Enjoy! Combine bourbon, no sipping for the cook, okay, go ahead, knock yourself out, pure maple syrup, orange juice, and balsamic vinegar. Bring to a boil then bring it down to a simmer and reduce the ingredients to an almost syrup. 5 Piece Stainless Steel Turkey Baster Set: This is a complete set to use for both turkey and poultry. This comes with an injector to inject the meat with a marinade, syringe, cleaning brush, and instant-read thermometer! I love this kit! This is my roasting pan! I have been using this for years and it is perfect for roasting! Especially turkey or prime rib. Strong and sturdy, to make a pan gravy is so easy in this pan. The gravy heats up well and no burning. People get overwhelmed with turkey. It is really a matter of just letting it cook and use a meat thermometer! Take the juices that fall to the bottom of the roasting pan and baste the turkey every 30 minutes. The glaze takes about 20 minutes to prepare and it goes on the turkey the last 30 minutes. This can be made ahead! Don’t forget, if the turkey skin is browning too fast, cover with aluminum foil. This is not complicated and it is just delicious! Rub turkey breast with olive oil and the spice rub from step 2. Into the cavity of the turkey, add half an onion, garlic cloves, carrot, and celery. Add second half of onion, more garlic, water, and chicken stock into the base of the roasting pan. Insert meat thermometer into the thick part of turkey breast. Place turkey in the oven, center rack. Roast turkey for 20 minutes. Reduce heat to 325 degrees. Continue cooking the turkey. Cover with foil if browning too much. A half hour before turkey should be done, about 2 hours, baste with Bourbon Maple Glaze. Baste the turkey every 10 minutes! The internal temperature of 165 degrees, turkey is done the cooking! A delicious Roasted Turkey recipe that is perfect for Thanksgiving, Holidays, and really anytime! The bourbon maple glaze is so flavorful and makes this turkey recipe so delicious! 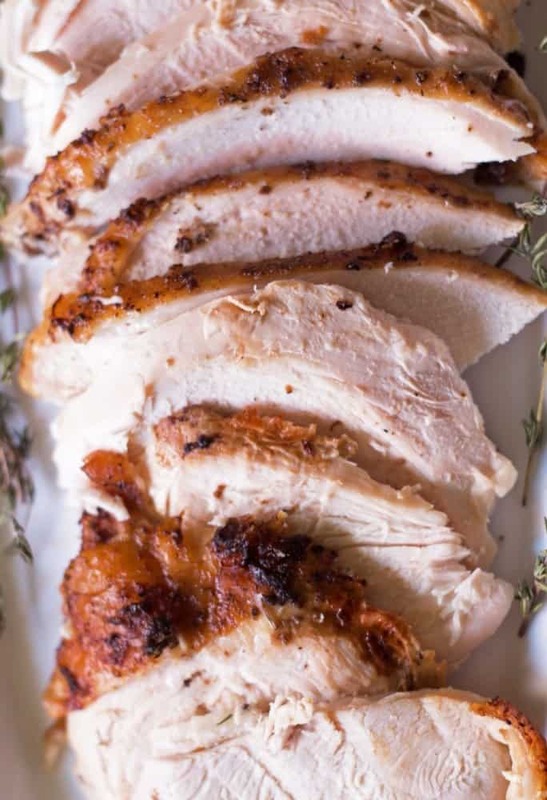 Roasted turkey breast with a bourbon maple glaze is moist and tender. This glaze is great on any turkey and also fabulous on any type of chicken. Easy to prepare and perfect for Thanksgiving or any Holiday! If the turkey breast is browning to quickly, cover with aluminum foil. Add more water or chicken stock to bottom of pan if needed. This is used to baste the turkey. Our absolutely favorite way to make turkey! I took your suggestion and we also make this with roast chicken and grilled poultry, such fantastic flavors! Thank you Bob! I am so glad you enjoy! Yup, this glaze is awesome on chicken and grilled poultry.